What is the best exercise for fat loss? You’d think this question was easy to answer after studying exercise and health for many years. You’d think I would know. I would think I would know, but when asking myself the question recently, it struck me that I didn’t. I can make a calculated guess, but I should know. What sort of exercise would you recommend for an overweight person wanting to lose weight? Cardio, strength, plyometrics, combos? What about sets, repetitions, load, restitution and what about energy expenditure? Different exercise forms give different stimuli and affect different tissues, so it is likely that some forms of exercise are to be preferred to others. But which? Let’s look at the basic science as an introduction. If I was to give an overweight person exercise advice based on a superficial glance at the scientific literature, the advice would be, “Don’t exercise. It doesn’t work”. Exercise trials are usualy ineffective unless accompanied by a dietary intervention. A 1995 meta-analysis  concluded that:. A recently published study showed how overweight women put to exercise regularly, unconsciously compensated for the increased activity level by being less active when not exercising . Based on my own experience with sports, I don’t find this odd at all. Joseph E. Donnelly from the University of Kansas was the lead author of the American College of Sports Medicine position stand on “Appropriate Physical Activity Intervention Strategies for Weight Loss and Prevention of Weight” from 2009 . Trouble is, there are no studies that can point to exercise being the cause of weight not gained. It’s all based on the much observed inverse relationship between body weight and physical activity level. It is based on two factors co appearing i.e. leanness and exercise, but we do not have any data suggesting that the exercise is the cause of the leanness. Evidence category A anyone? Donnely et al refer to the 2000 systematic review by Finnish researchers Mikael Fogelholm and Katriina T. Kukkonen-Harjula . This review concluded that “…the role of prescribed physical activity in prevention of weight gain remains modest.” Much of the blame is placed with study participants who showed poor adherence to exercise programs. The report from WCRF gives us several references in support of their argument that physical activity reduces the risk of obesity, but a closer look at the references reveals that more of the references go against the conclusion than are in support and none of the studies can show anything but correlation. It is not hard to paint a bleak picture of the role of exercise in weight loss and weight loss maintenance. However, I still remain convinced that exercise is and should be a cornerstone in obesity treatment. The trouble with exercise interventions is the same as is the subject of Gary Taubes recent blog post. The trouble is controlling for variables. If overweight people are included in an exercise intervention, it is very likely that they will also be more health conscientious when it comes to other lifestyle factors. When interventions that include both diet and exercise approaches are carried out, the researchers will try to control for the effect of different variables by doing multivariate analyses. But the analyses cannot and do not say anything about causation. Do people exercise because they are losing weight or are they losing weight because they exercise? The fact that exercise recommendations are based on the correlation between exercise and weight loss and the fact that no study can point to a definitive causal link, does not mean that that causal link is not there. It does not make it less likely that exercise do cause weight loss and prevent weight gain. It just means we have to be careful when interpreting and to be open to new information. The reporting of mean weight loss may also be deceiving. Boutcher and Dunn writes: “The results of exercise programmes designed to reduce body fat are disappointing. However, the reporting of weight loss as mean values disguises those individuals who do lose significant amounts of fat.” Again, weight loss in those who actually do lose weight when exercising might be caused by many things, but it might also be caused by exercise. In addition, there is the trouble with reporting only weight loss, and not body composition. Despite the lack of support from many scientific trials there are physiological mechanisms that make it likely that physical activity can prevent or protect against weight gain. There are also many risk factors related to the metabolic syndrome that are improved, seemingly by exercise alone – and if so, why should not fat mass be improved? The above mechanisms are the ones we have to efficiently address if we are to use physical activity as a weight loss tool. In addition many clues may in fact be hidden in articles whose conclusions does not favor exercise. I will break this subject into several posts. Next posts theme: does the amount of energy expended during exercise affect the amount of fat mass lost? 1. Garrow JS, Summerbell CD: Meta-analysis: effect of exercise, with or without dieting, on the body composition of overweight subjects. Eur J Clin Nutr 1995, 49: 1-10. 2. Manthou E, Gill JM, Wright A, Malkova D: Behavioural Compensatory Adjustments to Exercise Training In Overweight Women. Med Sci Sports Exerc 2009. 3. Donnelly JE, Blair SN, Jakicic JM, Manore MM, Rankin JW, Smith BK: American College of Sports Medicine Position Stand. Appropriate physical activity intervention strategies for weight loss and prevention of weight regain for adults. Med Sci Sports Exerc 2009, 41: 459-471. 4. Fogelholm M, Kukkonen-Harjula K: Does physical activity prevent weight gain–a systematic review. Obes Rev 2000, 1: 95-111. 5. Lee IM, Djousse L, Sesso HD, Wang L, Buring JE: Physical activity and weight gain prevention. JAMA 2010, 303: 1173-1179. 6. 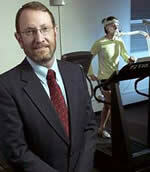 Boutcher SH, Dunn SL: Factors that may impede the weight loss response to exercise-based interventions. Obes Rev 2009, 10: 671-680. Forfatter paljabekkLagt ut på desember 20, 2010 mars 12, 2016 Kategorier Donnelly, exercise, Gary Taubes, weight loss2 kommentarer til What is the best exercise for fat loss?